Measure by Measure, Drop by Drop! You know how it is. Even when it’s done tongue-in-cheek—like The Smiths or Type O Negative—dour isn’t my thing. Bands like The Cure, who know how to craft tight, well-done songs, who know how to rock out, keep me at arms’ length. I don’t need an emotional range; I have a musical sugar addiction, and I expect it to be fed! 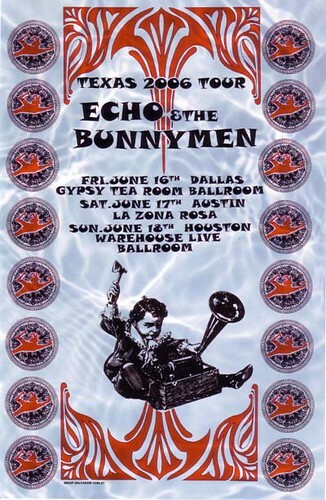 So I was surprised to find Echo and the Bunnymen (“The Killing Moon”? “Bring On The Dancing Horses? Zzzzz….) coming through for me with an awesome song I had previously overlooked: “Never Stop”! I like it! I really like it! In fact, the song is so cool I think that all rock bands should end their concerts with a cover of “Never Stop”! The title alone makes it a perfect last song, cause even though you’re stopping, you’re not! And the end of the show is the perfect time to show off your band’s musical influences, so why not pick up some easily-earned credibility with a shout-out to a cool eighties band? It’s so obvious! Someone had to have done it before, so I went hunting. But Google hasn’t shown me any musician who’s performed “Never Stop” in concert. Senor iTunes has no covers of the song at all, live or otherwise! Am I not searching hard enough? In fact, Echo and the Bunnymen themselves don’t end their shows with “Never Stop”! Even when they do two encores! I must be missing something. My all-sugar-all-the-time musical diet must interfere with any coherent musical decision-making I can perform. But rockers of the world, I want you to prove me wrong. I want you to end your show with a noisy, powerful rendition of “Never Stop.” Then tell me it doesn’t work for you and your fans. I’m hoping instead you’ll be pleased with the results. Comments Off on Measure by Measure, Drop by Drop!